Published by Adult Swim Games Developed by Big Pixel Studios Platform: Xbox One Players: 1-4 Genre: Action And Adventure Release date: 20th May 2015 Price: £11.99 Introduction ‘Hey, you guys……’ Chunk, Stef, Mikey, Mouth and Data. No you are not just about to sit done and play The Goonies. We present Mega Coin Squad, brought to the Xbox One by Big Pixel Studios and Adult Swim Games. A trip down memory lane for some of us, as Mega Coin Squad is a classic retro arcade game from the 1980’s. Big Pixel Studios have also developed other classic arcade style games such as: Bottle Cap Blitz, Off The Leash, Land-A-Panda and PiYo Blocks. And Mega Coin Squad is the studios latest release. Game Play - 6/10 Mega Coin Squad plays like your classic arcade style game in 2D and is set on very colourful backgrounds. From the main menu screen you are given the option to choose from one of five characters Chunk, Stef, Mikey, Mouth and Data. Each character has individual attributes so playing with a certain character may be to your advantage. For the completionist’s out there you will need to complete the game with each character, skill is a very important factor as some of the characters may be trickier to handle and less powerful than others. Mega Coin Island map is made up of four challenging areas, Green Valley, Desert Plains, Snow City and Lava Land each with 4 different levels within. After selecting the level you want, you are given a minimum amount of coins you will need to collect for that level. 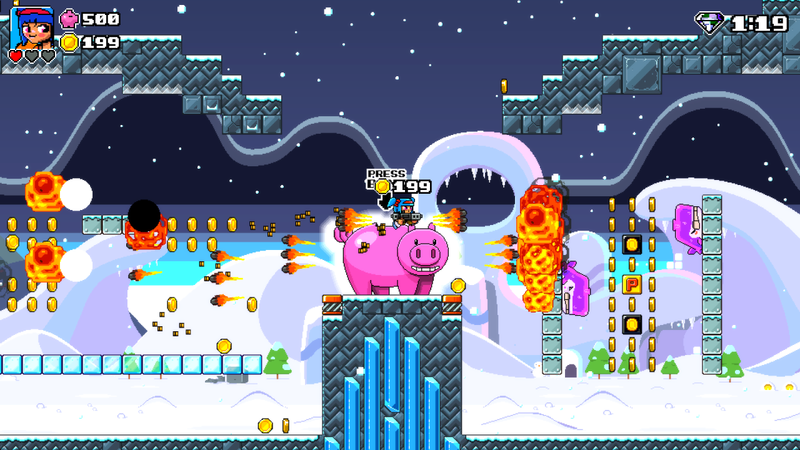 Coins collected can then be banked at any time via a huge pink piggy bank in the centre of the level itself. All levels are very confined with platforms and enclosures full of shiny gold coins to be collected. Amongst the coins are enemies and traps trying to take away one of the three lives you have, there is no way of regaining lives within the level so making mistakes is very unforgiving and slightly luck based. Another hurdle is the environment which over a short period of time will then disappear and a totally new environment will be created with new enemies, traps and obstacles. It’s not all doom and gloom as characters get a little help for the tricky conditions. Bombs are situated within brick blocks to blow a hole to gain entry to a plethora of coins or to kill nearby enemies which in turn drops a few bonus coins. The characters have a standard firing ability along with upward and sideway dash, which can smash through the normal standard blocks. There are also power up’s within the level that need hitting Mario style. They drop weapon upgrades and come in real handy on the later levels for clearing out enemies quickly. Every level has 3 bonus objective’s which may include collecting the minimum amount of coins in a set time, not losing a life or even collecting the set amount of coins in one deposit to the piggy bank. Completing the three objectives rewards you with three gems; these are then used between levels to have a go on a randomised box for special upgrades. These upgrades are a crucial part getting your character through the game. The levels do become very repetitive and do not have much variation in terms of objectives, so you may find yourself getting very frustrated very quickly. If you are a keen arcade gamer though, this will not be a problem. Skill and patience is key to beating all the levels and completing the game. There is also not many save points in the game which can be a little disheartening when you get return to the beginning of a certain area of the island. The other tedious thing is every now and then the game will freeze for a second which can land you in real trouble and frustrate you even more. Mega Coin Squad also has multiplayer mode of up to 4 players (locally), which is the part of the game Mega Coin Squad is made for. You and three friends can battle it out in different game modes and is a lot of fun. With a few classic multiplayer game modes it’s a shame a little more of the game was not focused on it, just to round the game off. Graphics – 5/10 Mega Coin Squad is based on a classic arcade game so graphics are not going to be like a triple AAA game. The graphics are more like playing the old Super Mario Bros or Donkey Kong. Every level is a 2D platform setup and is very small and confined. The enemies and environment are all very detailed and polished a lot more then your average arcade game from the past. At times there is also a hell of a lot going on, colourful rainbow bombs exploding, machine gun fireballs raining across the screen. The graphics handle every aspect well and you don't get lost in the moment. Overall the graphics are what they should be, just don't expect a next gen graphics in this game. 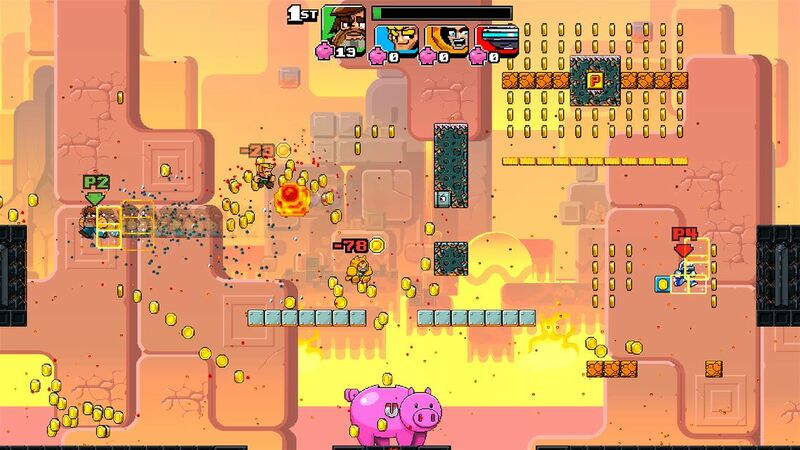 Sound – 4/10 The soundtrack to Mega Coin Squad is very fast and upbeat which compliments the gameplay, it also adds the element of fun to the game especially playing with friends. Again it's the sort of classic arcade music you would expect from a game like this, and adds to the authenticity of the game. Only downside is replaying the levels over and over again, the music does become repetitive and off putting as a lot of the levels all seem to sound the same after a while of playing. Having said this I cannot imagine any other music that would fit this genre of game. Difficulty – 8/10 Mega Coin Squad is not an easy game by any means and even a skilled arcade gamer may find this a challenging prospect. Every enemy you encounter will take a life away in one hit, so 3 lives is a very small amount to maintain, with no way of regaining any back. You will also drop all your coins when hit but will be invincible for a few seconds after, to regain as many as you can before they disappear from the screen for good. For the real achievement hunter’s out there this one is no easy task. Achievements – 7/10 Mega Coin Squad has a total of 22 achievements, ranging from just playing through the game completing it with specific characters to completing the entire island within 30 minutes, Daunting huh. The hardest achievement has to be completing the single player game without using any continues or retries, meaning you have to beat every level without losing all three lives in one sitting. One thing that stands out is the names of the achievements themselves. References to films clearly stand out from a fun list. And you can tell a bit of thought went into them which people appreciate. Summary Overall Mega Coin Squad does exactly what it says on the tin. A classic 2D platformer arcade game with bright and colourful environment’s. It’s another game which takes everybody back to their childhood days playing games like this for fun. If you are not planning off getting the full 1000G and love arcade games, this is for you. If you are looking for an easy completion then think again, as this will really test your patience and will power to keep replaying challenging levels over and over again. All in all another good effort from the guys at Big Pixel Studio, and will hopefully see more games developed by them in the future.